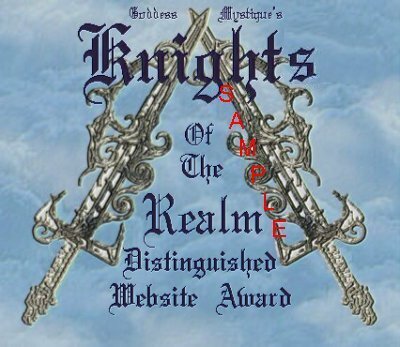 RULE: This Award will be given only to the Websites that offer the very best in Fantasy; Beauty; Humanitarianism; Creativity; and Originality. If you feel that your Website offers the 'ultimate' please feel free to apply. RULE: This Award will be given to the best 'all around' Websites. The theme does not necessarily have to be about Fantasy, but should at least cover one of the related areas listed in the Rules and Disclaimer Notice below. It must be Creative; Original; Informative; and Eye-catching. A site that would make the readers want to go back time and time again. RULE: This Award will be given to the Websites which are Most Informative. Their theme should focus on one of the following: Fantasy; Gaming; Role Playing; Science Fiction; Original/Creative Writing or Art; or Graphics Designs based upon these topics. 'How to's:', 'Rules of the game', 'Tips & Secrets', or other information that would serve to teach or help others will be the most likely candidates for this Award. RULES: This beautiful Award will be given to the Websites that are, as the title deems 'MOST ENCHANTING'. 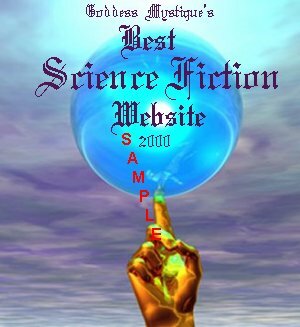 Beautiful artwork, creative writing, and an overall display for the love of Fantasy will definitely win this Award for your site. RULES: This Award will be given as it is titled. Websites will be judged in the following order. 1. Anyone may apply, however please note each Awards rules before making application. You may apply for more than one Award, but only one at a time per application. If you have a website, or would like to submit a friend or family members website, please feel free to do so. 2. First I will take into consideration the Award(s) that you are applying for. You may make a primary choice, and one alternative choice. 3. I will review your website, concentrating on the contents to be sure it satisfies the Award requested. 4. Once determination has been made that the Website does indeed satisfy the terms of the Award, you will receive an email from me in regards to this. 5. If it is judged that the Website which is submitted does not fit into the category of the Award that has been requested, I reserve the right to Award an alternative - more appropriate Award to that site, or not to Award the site at all. 6. Websites that are found to be hard to navigate, or with broken links will receive no awards until the problem is corrected. After corrections are made the owner should reapply to let me know the site is ready for judging. 7. Finally, I reserve the right to Award any Websites whether submitted or not that I happen to come across in my surfing adventures. It will be up to the discretion of the site owner as to whether they accept, and apply the Award or not. 8. This Awards program is structured mainly for Websites that are thematically related to Fantasy; Gaming; Role Playing; Science Fiction; Original/Creative Writing or Art; Graphics Designs based upon these topics; and other topics that I may deem appropriate. NOTE: More information regarding this process is listed on the Submission page.